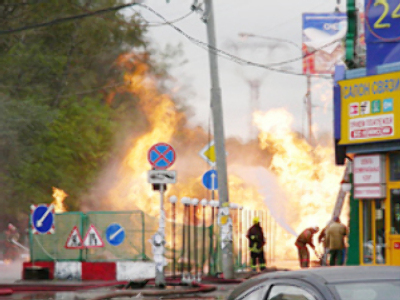 A fire at a major gas pipeline in northern Moscow has been reported. It has now been contained within an area of 10 square metres. Initially the fire engulfed about 200 square metres of market halls and cars parked in the area. Traffic has been blocked and a number of nearby apartment houses have had their gas supplies cut off.